Muriel Miguel, a founder of the feminist Native American collective Spiderwoman Theater, is considered a grandmother of the Indigenous theater movement in the United States and Canada. I’ve been interested to read how indigenous peoples around the world are reaching out to one another and starting to benefit from the strength of numbers. One result has been the emergence of international festivals staking out a place for native people in the arts world. I’m late with this story, but I wanted you to know about one such festival. It took place in January in New York City. “Ms. Johnson sees this year’s Dialogues as a microcosm of what the network may eventually accomplish, including opening up international exchange. For the Australian choreographer Mariaa Randall, whose ‘Footwork/Technique,’ [explores] the footwork of Aboriginal dances, a highlight of the Dialogues is the chance to simply talk and listen with peers from around the world. More at the New York Times, here. You remember the great marine explorer Jacques Cousteau? Well, his granddaughter has grown up to be an explorer of vanishing cultures, and recently she made a movie about endangered tribes in the Amazon. “Spanning more than 85,000 km2 (an area the size of Portugal), the Vale do Javari is the second largest indigenous territory in Brazil and is home to 5000 indigenous peoples from 6 tribes as well as the largest population of people living without any contact with the outside world in the entire Amazon and some say the world. Read more at the website, here, about what the International Union for Conservation of Nature calls “one of the irreplaceable areas of our planet.” And at the website for New York’s Explorers Club, which screened the film this past April, you can also can read about speaker Beto Marubo. A Marubo Indian, he has served with the national Indian foundation of Brazil, FUNAI, an initiative threatened by the likely election of someone Wikipedia calls “a polarizing and controversial politician” to the country’s presidency. The movie is more timely than ever. It’s interesting to me that at the same time that nationalism and harsh attitudes about migration are sweeping the Western world, some very different movements are gaining traction. One is the increased acknowledgment in some English-speaking countries that Europeans were once interlopers, too. Siobhan Burke writes at the New York Times about arts groups starting to pay attention to first residents. “On an evening in early June, before the sun had gone down, a bonfire blazed outside Abrons Arts Center on the Lower East Side. Handmade quilts lined the steps of the outdoor amphitheater. Anyone walking down Grand Street could come in and take a seat. As a group of singers arranged themselves around a large cylindrical drum, the choreographer Emily Johnson stood up to speak a few careful, welcoming words. “In recognizing Manhattan’s original inhabitants — the Lenape (pronounced len-AH-pay) — and their ancestral homeland, Lenapehoking, Ms. Johnson was taking part in a ritual that, with her guidance, has become increasingly common at New York performing arts spaces in the past year. “Ms. Johnson, 42, a Native Alaskan artist of Yupik descent, has been the catalyst for much of that progress in the city’s dance scene. … Wherever she tours, she publicly honors — and engages with — the Indigenous people of that place. “While land acknowledgment might be a mere formality in some contexts, Mr. Coumans emphasized that he sees it as something much greater, an invitation to consider and appreciate where, really, you are standing. Neris Uriana, the Wayuu tribe’s first-ever female chieftain, stands in her garden. With her leadership and new water-saving techniques, the northern Colombia tribe is finally able to grow food year-round. I’ve been reading articles by my friend Ann Tickner on Jane Addams, best known for founding Hull House in Chicago in the early 20th Century. Addams, an international peace activist who influenced the thinking of world leaders after WW I, was a more extraordinary woman than I realized in third grade, reading one of those little orange biographies in the school library. She was a model of all that women can be if they choose. In South America, there’s another surprising example of female leadership that I just heard about. It’s in an indigenous tribe, where the women are making sure that the people achieve their potential while living in harmony with nature. Global Post reporter Lucy Sherriff writes at Public Radio International (PRI), “For years, the Wayuu tribe in La Guajira, a remote area in northernmost Colombia, was run by a male chieftain. But 13 years ago, male elders decided to appoint a woman as its leader. After the success of being led by a female head, the community changed its governance traditions and now exclusively appoints women to lead. “Neris Uriana was elected in 2005. She was already involved in providing support to the community’s mothers, and Jorge Uriana, along with other elders, believed she had the qualities needed to lead the tribe. It was a first for Wayuu communities in Albania, in La Guajira. “ ‘We had had some problems with communicating with leaders of other tribes and in our own village,’ explained Jorge Uriana, who was the community leader until 2005 and is Neris Uriana’s husband. “Jorge Uriana explained that traditionally, Wayuu men negotiate and resolve disputes but that some male leaders can come off as confrontational and even aggressive at times. Excuse me, I have to stop here and marvel: that is exactly why Jane Addams and her contemporaries in the peace movement are considered the founders of what is known today as feminist diplomacy. ” ‘We wanted to turn the way things were on its head. We wanted women to use their way of dialogue to resolve our conflicts, and we wanted to transform our culture,’ [said Jorge Uriana]. “Marta Pushiana is one of the many women who have become more involved in the tribe’s community since Neris Uriana’s appointment. Oh, my, I am in love with these people! Read more about them at PRI, here. A woman from the Wayuu tribe who is part of the female chieftain’s food initiative waters the saplings. The initiative has been such a success that the tribe now produces surplus food and sells it to other communities. 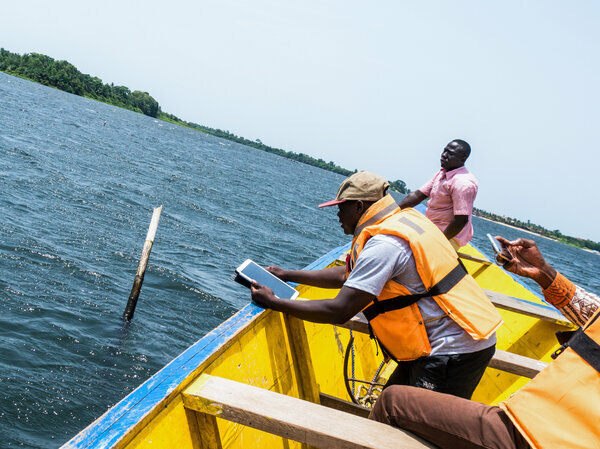 Samuel-Richard Bogobley holds a GPS-enabled tablet to capture the location of one corner of an underwater clam “farm.” Collecting data is the first step in protecting indigenous livelihoods. I love reading about how people around the world come up with constructive ways to use technology. This story is about clam farmers in Africa enlisting GPS data as a first step in protecting indigenous rights. Writes Tim McDonnell at National Public Radio, “Samuel-Richard Bogobley is wearing a bright orange life vest and leaning precariously over the edge of a fishing canoe on the Volta River estuary, a gorgeous wildlife refuge where Ghana’s biggest river meets the Gulf of Guinea. “The Volta River is rich with clams, harvested year-round by a bustling community of several hundred fishermen and women. The meat is packaged for sale across West Africa, while the shells are ground into an additive for whitewash and chicken feed. “The riverbed itself is divided into intricate real-estate parcels, each one an underwater clam ‘farm’ with its own caretaker. “[Clam farmer Kofi] Amatey spends most of every day working here about ten feet below the surface, gathering clams into a basket. Wearing eye goggles and a weighted belt, he breathes through a makeshift scuba apparatus that pumps air from a compressor on his canoe. “It’s a subsistence living: Amatey estimates that he earns less than $1,000 per year. And in recent years, it’s gotten even harder. An example of the resurgence of indigenous theater is Our Voices Will Be Heard, directed by Larissa FastHorse. It was performed at Perseverance Theatre in 2016 in Alaska. Another way that culture gets shared, revitalized, and preserved is through theatrical performances. Alaska and Hawaii, in particular, are seeing a resurgence of indigenous theater. As Frances Madeson writes at American Theatre, “The pace at which producers of Hawaiian and Alaskan Native theatres are creating original offerings specific to their lands and peoples and mounting them on their mainstages ranges somewhere in the giddy spectrum between prestissimo and full-tilt boogie. “There is also an attitudinal shift by institutional gatekeepers toward inclusion of Native theatre artists, some of whom have been maintaining the vision for a very long time with minimal support. “But now that the vessel’s been unstoppered, there’s a growing groundswell of audience demand for shows with Native-centric realities and expression. “Katasse teaches theatre in schools to Alaska Native kids, and encourages them to take acting seriously. ‘They didn’t even know this was a career option,’ he said. “In Fairbanks, Alaska, [Allan Hayton, language revitalization program director at Doyon Foundation] pursues theatre as a vehicle for cultural and linguistic survival. “For Starbard, Alaska Native theatre artists literally standing on thousands of years of storytelling tradition have nothing to prove.